In general, parallel flow heat exchangers considered less efficient than counter flow heat exchangers in terms of transferring heat from one fluid to another. However, there are applications where parallel flow has its benefits, such as when limiting the transfer of heat is recommended. How to choose Heat Exchanger for Koi Fish Pond? Koi fish ponds are beautiful to look at, yet can be expensive to maintain. Therefore, you want to make sure you do everything you can to protect the integrity of your Koi fish pond. It is essential that the heat exchanger for your Koi fish pond has nickel brazing in order to avoid copper toxicity in your Koi fish. 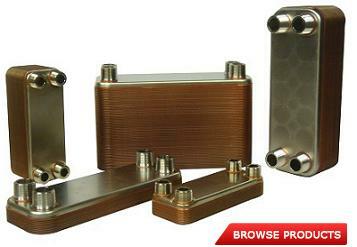 Brazetek plans to offer nickel brazed heat exchangers within the next few months. For those people who are tiered of shovelling snow, slipping on ice and bringing wet shoes and salt across that expensive carpet there is a better, more cost effective solution this winter that can make life a lot easier. Besides the dimensions of the plates, the type of corrugation also affects the thermal performance of the brazed plate heat exchanger. Hydronic heating systems are hot water heating systems that use water as a medium for conveying and transmitting the heat to the various rooms and spaces within a structure. Hydronic heating systems are based either on gravity flow principle or forced circulation. Hydronic heating or forced-hot-water heating is widely used in residential and commercial structures. A strainer as you can certainly make out is a device which is used for filtering a flowing fluid like water or air. We need strainers in many industries, especially where any impurity in the flowing fluid can affect the efficiency of the process or machinery resulting in productivity losses. However, does it really matter in a domestic setting? Should you be concerned about productivity losses in equipments like heat exchangers at your home? Well, perhaps you should be. Most geothermal fluids, because of their elevated temperature, contain a variety of dissolved chemicals. These chemicals are frequently corrosive toward standard materials of construction of heat exchangers. As a result, it is advisable in most cases to isolate the geothermal fluid from the process to which heat is being transferred.